The marketing field is an oversaturated market, full of fierce competitors and ambivalent clientele. Today’s marketers need a variety of skills, not only to keep up with fellow competitors but to remain vital and relevant to their audiences. To achieve the staying power needed to appeal to your users and set yourself ahead of the pack, we suggest implementing these five practices. In this infographic, we talk about just that and how these practices are beneficial to you and your marketing team. So, do you have what it takes to be a marketer in today’s arena? 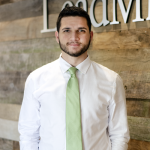 Follow LeadMD as we take you through the most successful habits of a modern marketer.